Educa 13429 -Jigsaw puzzle with 4000 durable pieces. -For ages 8 and up. 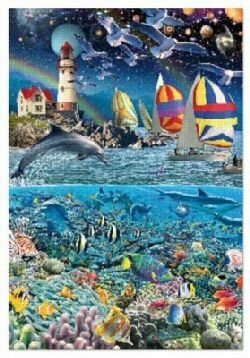 -This puzzle contains vibrantly colored images of all kinds of life including; dolphins, fish, coral, birds, moon and stars, planets, birds, lighthouse and a rainbow. -Includes Educa's lost puzzle piece guarantee and special glue to display the puzzle when completed.